What a strange weekend it’s been. 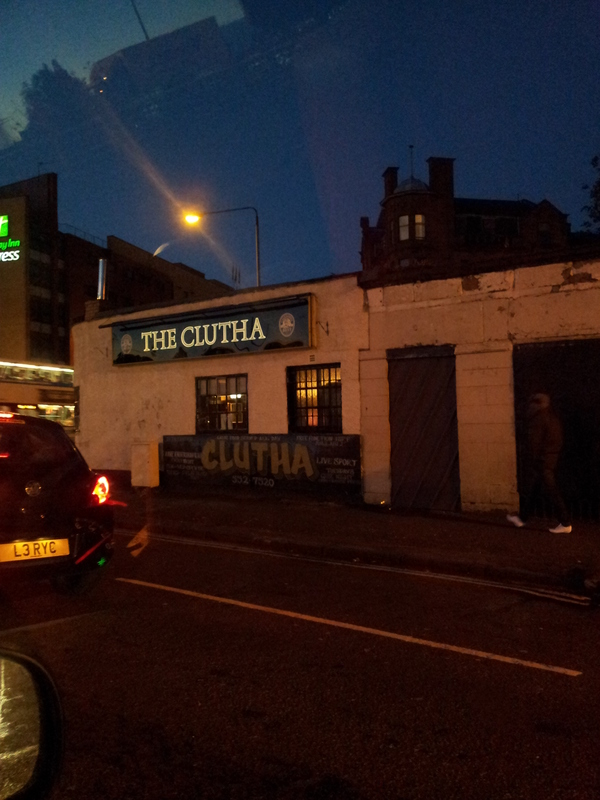 Above is a picture I took of the Clutha pub, scene of that terrible accident on Friday night. Never thought when I took this picture a few weeks ago, when I was bored travelling home, that such a thing could happen. Am so sorry for the people who have lost family and friends in this tragedy and I hope that everyone who was injured recovers. We had a couple of friends in that bar that night: one got out unscathed-ish (she’s still very shaken) and the other is currently in hospital with quite serious injuries. We hope she gets better soon. Anyway, it was my birthday yesterday, so we started celebrating early: on Friday hubby and I went to see Thor and we had lunch together and it was so nice to get some time alone with him. We never have total peace…our kids are noisy and boisterous and full of life, which is great, but sometimes we need our time together. Yesterday, once we’d established our friends were okay (well one isn’t, but she’s recovering) we had a quiet day before going to The Village Rest in Luss. What a great restaurant it is! Great food and a really nice place. It was good for the kids too because they could get food they liked. We were stuffed and it was just great. Then we came home and chilled out in front of the telly. Perhaps my day wasn’t everyone’s idea of a good birthday, but it was for me. My life is so busy all the time that to get a bit of me time is precious and that’s exactly what I got. So, anyway, before I go on I’d like to say thanks to hubby, the kids, family and friends for all the lovely pressies and birthday wishes I received!! Right I am off to do something domestic. Piano practise is done, bread is cooking, got loads of ironing and washing to do…sigh. PS below is a blog I was supposed to put up on the 25th, but due to technical issues, was unable to. Hello there! How are you? What have you been up to? I can’t say I’ve been up to anything truly exciting, but the week has been busy none-the-less. It’s funny how time is flying by faster and faster…before I know it it’ll be Christmas and I’ll be wondering again where the year has gone. Anyway, here’s me wittering on again about nothing in particular when all you are wanting is to read something interesting and maybe educational. Well, okay, maybe something interesting…not sure if my blog is ever educational!! Right, what have I been doing all week? Well, there was a piano lesson last Thursday whereby my teacher gave me We Wish You a Merry Christmas to learn in time for the festive season (my husband is no doubt really looking forward to hearing my rendition on Boxing Day along with our daughter on – squeaky – recorder!). My parents were visiting on Thursday afternoon to see the boy who turned six last week. My dad came with me to collect him and his sister. The wee man came out of school all full of purpose as he usually does and stood beside me. I said: “Look who’s here.” He said: “Who?” and it took him about five minutes to realise his grandfather was standing beside me. He was all beaming smiles though when he saw him, which was nice. The girl, of course (not one to miss anything), spotted her grampa from a ‘mile’ off and ran into his arms. On Friday, I visited my friend for our usual cup of tea and cake. Then we popped down to The Commodore in Helensburgh for a spot of lunch. That was good. Friday is pizza night and we ate it as usual on trays in front of the telly. We watched a film, but I can’t remember what is was…sigh, it’s old age I tell ya!! Saturday, I took the girl to her art lesson, bought wee bits and pieces for Christmas, drank tea with another friend whose daughter is also in the class, picked the girl up and went home. In the afternoon, I caught up on housework and crocheted yet another lap blanket…this time I finished one for the boy. He wheedled it out of me yesterday and has been wearing it like a cloak ever since. I’ve started one for the girl. Yesterday (Sunday) I had to miss my usual swim and stay in as I seem to have the Lurgy again. Didn’t fancy passing it on to fellow swimmers or getting caught short in the pool, so stayed at home and crocheted. By the afternoon, it had gotten better and me and the boy went to the local supermarket to pick up supplies. As we did this, hubby took an excavator upstairs to clear out the boy’s pigsty of a room. Okay, that’s a slight exaggeration, but he did clear out six bin-bags of rubbish and broken toys. SIX!! The boy’s room is now looking like it should (ie tidy and pleasant to be in). I spent the rest of Sunday afternoon lying on my bed, feeling ill and watching a slushy Christmas movie on telly (can’t remember what it was called, it was one of those afternoon movies that the Americans make so well – made for tv movies?? All romance and slush. I enjoyed it none-the-less). Ooh, forgot to brag…I have now bought everything for Christmas, I have nearly finished my Christmas cards and wrapped around half my presents. How good am I this year?? It is of course all down to the fact that I hate all the extra work and stresses Christmas brings, so am trying to get it all done by December 1 so that I can enjoy all the festivities in the run up to the big day!! It’s purely a self preservation thing!! Can’t wait til the Christmas hols!! Currently watching: haven’t seen Saturday’s Dr Who yet as was watching other stuff. I’ve heard mixed reviews, but will still watch it. Saw the new Oz film yesterday…it was disappointingly okay. Sigh. Not a patch on The Wizard of Oz. Great special effects though! Currently listening to: Radio 2. Right, am off. Til next time.